Ice Rentals $160 per sheet for 2 hours. Book ice for $160 (GST included) per sheet for two hours. All equipment such as grippers, brooms and sliders are included in the price. Each sheet houses 8 people. Instruction is required for groups that have no one with previous curling experience for an additional $40 (GST included). Please specify at the time of booking if you require an instructor. Bookings must be made at least three full days in advance. Please call the office to see if a rental could be accommodated with in this window. Payments must be made by providing credit card information on our secure online booking site. If you prefer not to pay online, contact Pam to arrange an alternative method of payment in order to secure and complete your booking. Club Members at the Marpole Curling Club are eligible for a discount. Please email Pam to secure your discount. Click here for availability and to book online. Click here for our ice rental terms and conditions. Full Facility Rentals $1,500 – $2000 for 5-7 hours. 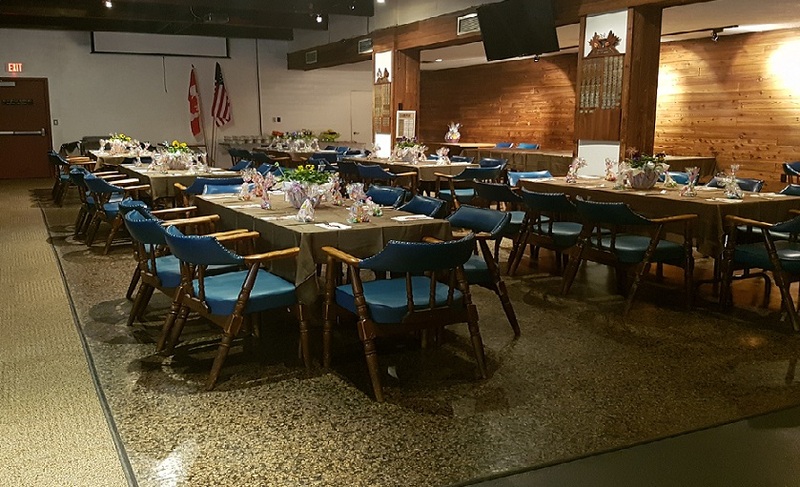 Book our facility for 5 hours ($1,500 GST included) or 7 hours ($2,000 GST included) and gain access to 6 sheets of curling ice (holds up to 48 people at one time), 120 seat lounge (with bartender), meeting room and games room. Club Members are eligible for a discount on ice fees. To book a full facility rental, please contact Pam at 604-327-3400 or pam@marpolecurling.ca. Please read our facility rental terms and conditions here before you book. Party (Lounge) & Meeting Room Rentals $50 – $75 per hour. The Dan Magnuson Room can handle all of your meeting room needs for only $50/hour. It can be configured in a variety of ways and can seat smaller groups of 10-15 in a boardroom style and up to about 45 or so in a classroom style. Payments can be made by cheque, cash, credit (Visa/Mastercard). Want to throw a party (no curling) and just need space? Our lounge can accommodate a group of 100 for only $75 / hour. Hungry too ? see our catering info below for info on banquets. School Groups $55 per sheet per hour. Local High School group visits are available for up to 48 students/per visit. A brief group instruction is provided during the first time a group of students attends in the season, but is not required during additional visits. Rates are $55/sheet/hour (each sheet holds up to 8 students) and $28/group instruction. GST is added to the rental total. Our professional cafe and catering services are available for groups over 30 people. We may be able to cater for smaller groups. Outside food is not permitted. Click here to view our current menus & prices.